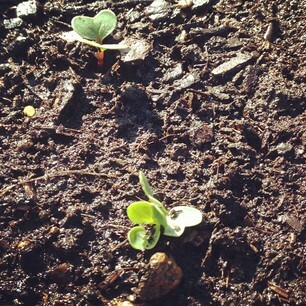 The other morning I walked tentatively to the garden bed to find an excellent surprise: the garden is growing! I’m not sure why I’m so surprised by this “phenomenon.” Don’t gardens grow? Isn’t that what they do? Wasn’t that the purpose of sowing seeds and watering incessantly? Sprouting radishes. I'm so proud. 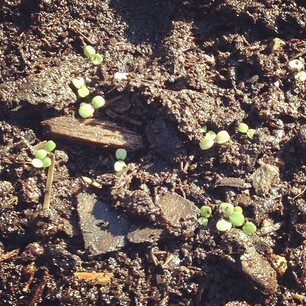 I see a slight bit of growth on the spinach side of the bed, and the beets are just peeking out. We are expected to have weather in the mid-80s tomorrow, so I’m hoping my darling veggies will respond. Enjoy your weekend! I’m off to water MY garden. It is miraculous, isn’t it??? Love your photos! Thanks! Such cute little green tops from a tiny seed! I really am amazed by it all. I hope so! I’m sending them good vibes as we speak. The spinach and beets are moving at a slower pace than the rest of the veggies, so I’m keeping my fingers crossed for them. Thanks for stopping by!